In meeting the challenges and responsibilities of providing electricity to nearly nine million people in a 600-square mile area, which includes New York City and most of Westchester County, Consolidated Edison Company of New York, Inc. constructed one of the nation’s first large-scale atomic power plants at Indian Point, 24 miles north of New York City, on the Hudson River. 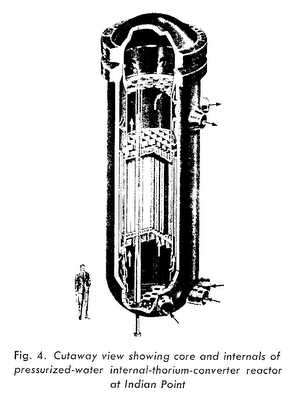 After considering several reactor types, Con Edison in 1955 selected for development a pressurized-water thorium-uranium converter reactor. This concept was proposed by the B&W Co ., the contractor for basic nuclear engineering and the designer and manufacturer of the major items of nuclear plant equipment. 1. Thorium occurs quite abundantly in easily mined deposits of monazite in a number of countries, notably India, Brazil, and Australia. 2. 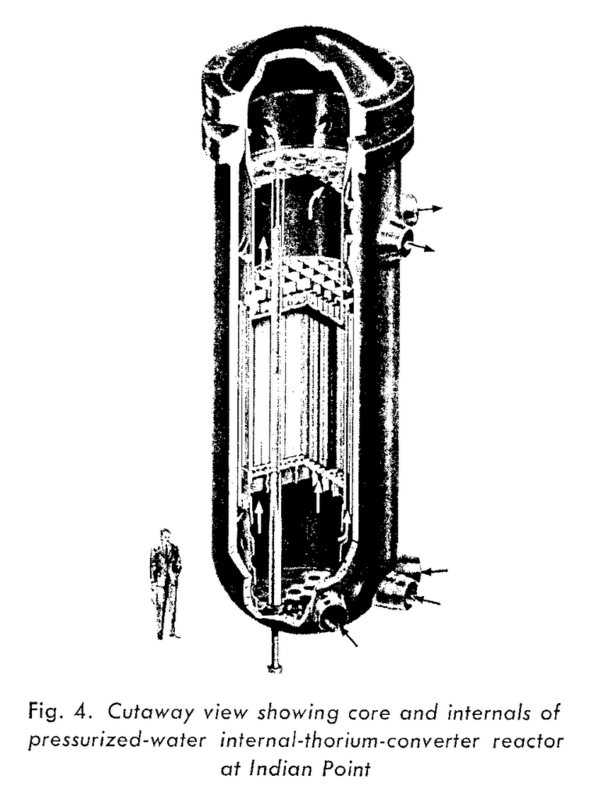 Conversion of thorium makes a better nuclear fuel for thermal reactors than does conversion of U-238. 3. Thorium metal has fair tensile strength, good mechanical-working properties, and machining characteristics comparable to those of mild steel. The oxide (ThO2) is very stable even at elevated temperatures. 4. Thorium can be used in many forms as a fertile or blanket material in power breeder reactors. 5. The operating temperature of thorium in reactors is not limited by allotropic transformation as is the case for uranium, where the alpha-beta phase change still limits the performance of certain reactors. While thorium is disadvantaged in a pressurized-water reactor relative to a liquid-fluoride reactor, it still has a number of benefits. It is interesting to note that they were sufficient for B&W to fuel the Indian Point 1 reactor on thorium initially.